Alzheimer’s disease is a progressive brain disorder that damages and destroys brain cells, and leads to memory loss, confusion, and eventually death. For decades, brain regeneration or repair was not possible. However, current research continues to show that common foods like broccoli contain sulforaphane compounds that can stimulate the renewal and repair of nerve tissue in the brain. The father of neuroscience, Santiago Ramon y Cajal, once declared that “nothing may be regenerated” in the adult brain. Fast forward to the 1960s when Massachusetts Institute of Technology (MIT) scientist Joseph Altman reported that the hippocampus of guinea pigs and adult rats, as well as the cortex of cats, underwent the process of neurogenesis—also known as the growth and development of nerve tissue. More evidence has continued to show that the brain is in a state of self-regeneration and self-repair, where it relies on neural stem cells to repair and replace aged and damaged brain tissue. The evidence is encouraging in an era of widespread neurodegenerative diseases, including Alzheimer’s disease, Parkinson’s disease, and Huntington’s disease. 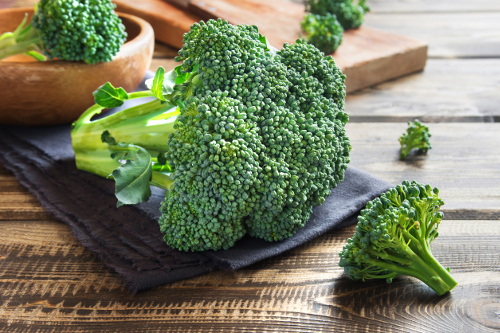 The latest substance to be studied for its neuritogenic properties is the sulfur-containing biomolecule called sulforaphane found in cruciferous vegetables, including broccoli. In a study published in the journal Genesis in March of 2017, Chinese researchers found that sulforaphane may have significant ameliorative properties against underlying pathological disturbances found in common neurodegenerative diseases. These include increased inflammation, disconcerted calcium homeostasis, oxidative stress, and neuronal death. The theory from the authors is that sulforaphane may alleviate these factors, while also stimulating neural stem cell activity. The study evaluated sulforaphane and whether it could protect and regulate neural stem cells, and therefore, display possible neuroprotective properties. The research team also wanted to determine whether sulforaphane’s therapeutic effects depend on its Wnt signaling properties, which are considered a key molecular pathway linked to tissue regeneration. So, what did the researchers find? First, sulforaphane was found to have concentrations that promote neural stem cell growth without harming any neurons. Sulforaphane also modified genes in the Wnt signaling pathway. Also, exposing neural stem cells to sulforaphane resulted in differences of neurons, which supports the hypothesis that sulforaphane could stimulate brain repair. The research supports the claim that consumption of sulforaphane-containing foods may provide therapeutic benefit in the treatment of degenerative brain disorders. Simply eating these foods is a preventative measure that is safe and effective for brain health. They also have a therapeutic benefit for pre-diabetes, multiple sclerosis, and various cancers like oral cancer, pancreatic cancer, and stomach cancer. Besides broccoli, sulforaphane is found in other cruciferous vegetables, such as cauliflower, cabbage, Brussels sprouts, bok choy, arugula, collard greens, kale, radish, mustard greens, watercress, kohlrabi, broccoli raab, and turnip. However, while all cruciferous vegetables contain high amounts of sulforaphane, broccoli sprouts possess 20 times more sulforaphane concentration than the mature broccoli plant. Broccoli sprouts have also been shown to relieve ulcers and improve autism symptoms. Besides broccoli and cruciferous vegetables, there are other foods that promote brain health and have the potential for cell regeneration. The following is a brief description of five other brain foods that you can include in your diet. Although curcumin is the often-researched component of turmeric, there are other therapeutic properties inside this golden herb. The fat-soluble compound in turmeric called aromatic-turmerone appears to be ideal for enhancing the brain’s natural regenerative processes. A study published in the journal Stem Cell Research & Therapy in 2014, found that aromatic-turmerone is promising for brain regeneration in neurologic disease. The study found that the number of neural stem cells increased through enhanced proliferation when brain cells were exposed to aromatic-turmerone. These new neural stem cells also increased the number of neuronal cells, and therefore, a healing effect occurred. For the study, rats injected with aromatic-turmerone into the brain experienced an increase in neural stem cell proliferation and newly-formed brain cells. Although ginger is known for its digestive benefits, this knobby root is also an incredible brain food that can help fight neurological diseases like Alzheimer’s disease. A study published in the Evidence-Based Complementary and Alternative Medicine in 2012 found that ginger consumption enhanced brain function in 60 middle-aged women. The ginger extract improved working memory and reaction time. Several other studies show that ginger is protective against age-related brain decline. Blueberries contain antioxidants and phytochemicals that reduce neurodegenerative oxidative stress and improve memory, thinking, and learning. Wild blueberries also have high levels of anthocyanin and other antioxidants that guard against Alzheimer’s disease and other neurological diseases. High levels of an antioxidant in blueberries called gallic acid, also help protect the brain from degeneration and oxidative stress. Bone broth is the ultimate health food that helps treat leaky gut syndrome. It can also heal the brain. The high level of collagen in bone broth decreases intestinal inflammation, and its amino acids, like glycine and proline, will boost immune function and improve memory. The omega-3 fatty acids found in wild Alaskan salmon and other fatty fish can help fight inflammation in the brain, while also offering protection to brain cells. A study published in the peer-reviewed journal Neurology in 2013, found that women aged 65 and older with the highest levels of omega-3 fats had better brain preservation as they aged than women with lower levels of omega-3. Other research shows that omega-3 significantly increases activation of the dorsolateral prefrontal cortex area of the brain, which is associated with memory. Additional brain foods include rosemary, walnuts, eggs, extra virgin olive oil, coconut oil, celery, beets, and avocados. The diet is a great place to start for brain health, especially for preventing Alzheimer’s disease or dementia. The current research on brain regeneration foods is quite incredible; however, there are also other strategies that can help improve brain health. Here are five general diet strategies that promote a healthy brain. Be mindful of how much meat you’re eating weekly, and choose grass-fed beef when available. Too much iron-rich beef will lead to brain degeneration. Diets high in carbs and sugar will also lead to Alzheimer’s disease risk. It is best to avoid refined carbs like white bread, cookies, white rice, and crackers. AGEs (advanced glycation end products) are chemicals found naturally in the body and in some foods. High amounts of AGEs are linked to Alzheimer’s disease risk. Although all foods contain some amount of AGEs, cheeses, meats, and animal fats tend to contain the most AGEs. Toxic metals like aluminum is a potential root cause of Alzheimer’s disease. Certain foods like baked goods will contain aluminum, and therefore, it is important to read labels carefully. Also, avoid beverages in aluminum cans and food cooked in aluminum pots. A low glycemic diet will reduce blood sugar levels at a slower rate. Research shows that high blood sugar levels are linked with an increased risk of Alzheimer’s disease. Ji, S., “Broccoli can Stimulate Brain Regeneration, New Research Suggests,” GreenMedinfo, March 13, 2017; http://www.greenmedinfo.com/blog/broccoli-can-stimulate-brain-regeneration-new-research-suggests. Ji, S., “How WHOLE Turmeric Heals The Damaged Brain,” GreenMedinfo, October 1, 2014; http://www.greenmedinfo.com/blog/how-whole-turmeric-heals-damaged-brain-1. Hucklenbroich, J., et al., “Aromatic-turmerone induces neural stem cell proliferation in vitro and in vivo,” Stem Cell Research & Therapy, 2014; 5: 100. doi: 10.1186/scrt500. Han, Z., et al., “Effects of sulforaphane on neural stem cell proliferation and differentiation,” Genesis, March 2017; 55(3). doi: 10.1002/dvg.23022. Balch, J., et al., Prescription for Natural Cures: A Self-Care Guide for Treating Health Problems with Natural Remedies Including Diet, Nutrition, Supplements, and Other Holistic Methods (Hoboken: John Wiley & Sons, Inc., 2004), 38-45. Saenghong, N., et al., “Zingiber officinale Improves Cognitive Function of the Middle-Aged Healthy Women,” Evidence-Based Complementary and Alternative Medicine, 2012; 2012: 383062, doi: 10.1155/2012/383062. Ammann, E.M., et al., “Omega-3 fatty acids and domain-specific cognitive aging,” Neurology, September 25, 2013; doi: 10.1212/WNL.0b013e3182a9584c.